OPTC Guideblog: Finally... Mihawk is here!!! 29th April - 30th April!! Dracule "Hawkeye" Mihawk is here and is ready for Capture in the usual 30-Stamina and 40-Stamina Island. For those struggling and new players alike, here's a quick run-down on how to use Mihawk and why you should care. Swordsmen Teams have recently been getting attention as one of the up and coming greatest team in the game. And what better way to start one, but with the "Strongest Swordsman Of the World" Hawkeye Mihawk. 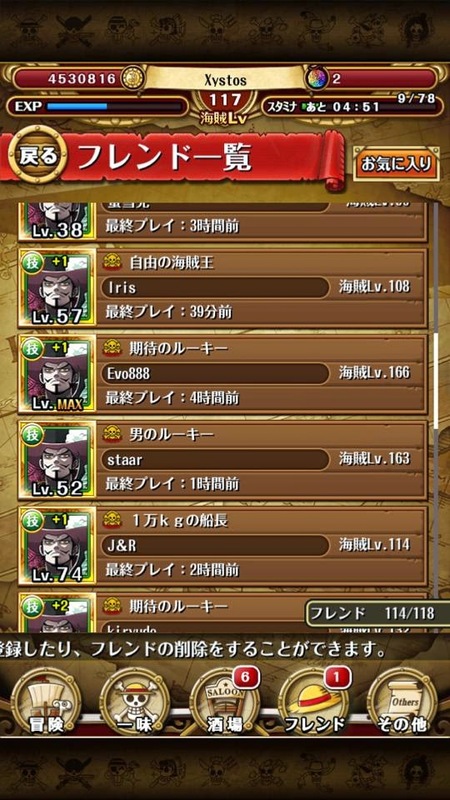 Don't worry about running out of friend Mihawks either, there are plenty of Mihawks to go around. And perhaps unlike other 2.5x lead, the Swordsmen teams are generally fairly bulky lacking recovery but making up for it with superior health and attack. They are easy to build and create and has a nice range of utility that can be used in their teams. 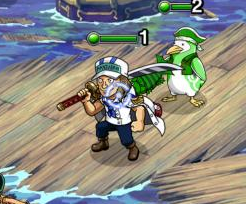 Red-Haired Shanks - One of the "better" units of the game. If that isn't enough, consider this... If you plan on getting other "24-Hour Bosses" or "Raid Bosses", Mihawk's Special that deals 30% of the enemies' current health will become invaluable in your hunt for some of the greatest characters around. ANY CREW-MEMBER CAN BE USED! "Lion Song" Zolo and Vivi works in a very simple way. Zolo will reduce all incoming damage by 80% (While HP is full) and Vivi will heal you back up to full to continue the cycle. I highly recommend newer players that use this team to do Stage 30 instead of Stage 40. This is due to Stage 40 Mihawk doing 25,000 damage with his special (when he gets to 25% health or less) even with Vivi's Recovery you will not be able to recover the full thing. Pre-requisite: Vivi must be at least level 72 to heal 2000 HP (as 30-Stamina Mihawk does 10,000 damage). NOTE: Depending on your subs and your damage, you may be able to burst down 25% of Mihawk's health easily and you may not need to worry about Mihawk's high damage special. Probably the best team for new players and possibly veterens who wants to play safe. The Laboon/Vivi team can withstand even Stage 40 version of Mihawk. 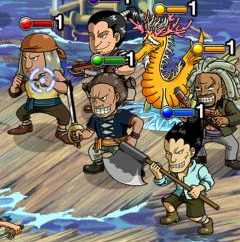 The team pictured is a team that can clear 40 Stamina Mihawk for example. Pre-requisite: Your team's total HP (including your Friend and ship) must NOT be more than 2x Vivi's Healing (5x Vivi's Recovery). This team only works if Vivi can heal your team back up to 50% or more. This will activate Laboon's Leader skill (Survives any one hit while your above 50% health). 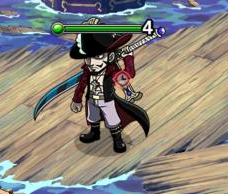 Lucky players with Whitebeard may be able to pull off a double Whitebeard team for a crushing defeat upon Mihawk. A decent Force Team and a Turn-delay Usopp will be crucial to the team's success. Gear 3 Luffy teams hold one of the top 3 highest ATK boost in the game. Gear 3 Luffy teams will be able to finish Mihawk in a matter of 2 turns simply due to the sheer strength and Force of the teams. It will take a lot of "PERFECTS" though. The Stage 30 is a miniature version of the Stage 40 (merely reduced damage and maybe an enemy or two taken out). As a result, the Stage 40 enemies will be covered with a mention for any differences for Stage 30. 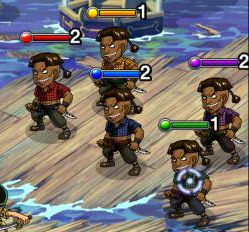 Stage 30 - 3 mobs will appear (Usually the Red, Blue and Green), easy to get rid of. Stage 40 - 5 mobs will appear (One of each colour), Still fairly weak though. Stage 30 - You will fight 1 Teenage Turtle, Hopefully 1 will drop for you. Stage 40 - You will fight 3 Teenage Turtles. Hopefully 1 will drop for you. The "Fourth Round" is considered the "Make it or Break it"
Round. You must pay ATTENTION somewhat to this round. 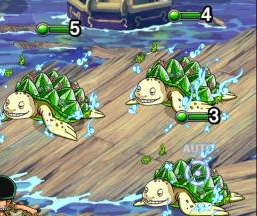 Each Unit has high defence meaning you will deal "Turtle-Like" damage to them. The Elder Seahorse will lock a Random Unit for 6-Turns. Stage 30 - You will fight one of each colour but the Elder Seahorse will NOT be present. Stage 40 - The elder Seahorse will be present. The Boss Mihawk will fight you in the Fifth Round regardless of your Stage. Special Move: Deal 10,000 damage. Special Move: Deal 25,000 damage.